Hi all, I made two tcz packages for tinycorelinux's Chinese support, one is locale support, the other is fcitx input method. OK. jyf and I will test it according the guide and submit it when finished. Thanks, you are right, I've a mistake. A file missing will cause IM can't be actived in gtk program. 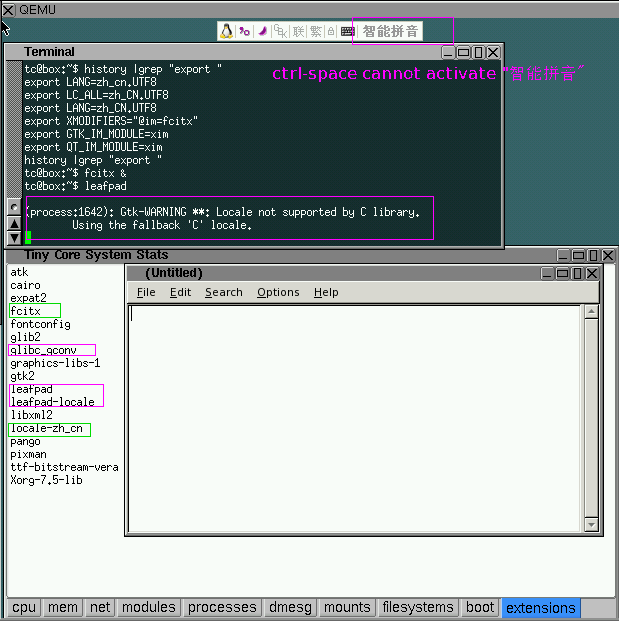 I can start fcitx but it cannot input to leafpad or gtk programs. could you kindly fix it so we could move up to TC 3.x? thank you for the work. Is someone already translating the Chinese Fora topics in English? I think this is a welcome to make Tiny/MicroCore a more popular Linux distribution. Micro/TinyCore already has world's most brilliant people working on it. 此帖于 10-08-16 17:38 被 hujy 编辑. Using the fcitx that is compiled offical,just copy the compiled file to /usr . 此帖于 11-02-17 14:00 被 aswjh 编辑. still failed to fix fcitx.